All trips will depart from the Knoxville Hilton lobby, unless otherwise noted below. 1. Quaternary Faulting along the Dandridge-Vonore Fault Zone in the Eastern Tennessee Seismic Zone. 11 April, 7:30 a.m.–4:30 p.m. Max: 20. US$105. Principal organizer: Robert D. Hatcher, Jr., University of Tennessee–Knoxville; co-organizer: Randel Tom Cox, University of Memphis. 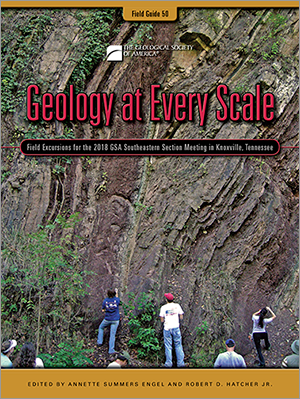 Description: Field trip participants will visit three accessible sites that involve bedrock faulted against Quaternary river sediments, including a thrust fault on the Little River near Alcoa, Tennessee, a series of thrust faults exposed in a drainage ditch that thrust Conasauga Shale against Quaternary colluvium in the footwall, and a normal fault at Tellico Lake near Vonore, Tennessee, with Quaternary sediments faulted against Consasuga Shale, lake level permitting. 2. The Blue Ridge Basement Complex of the Eastern Great Smoky Mountains: New Insight into Old Rocks from New U-Pb Geochronology. 11 April. Max: 20. US$60. Participants should arrange their own lodging for the night of 10 April in the Maggie Valley–Dellwood–Waynesville area, North Carolina. Trip will depart from the parking lot of the Maggie Valley Inn & Conference Center, North Carolina, at 8 a.m., returning mid-day. Principal organizer: David Moecher, University of Kentucky. Description: This is a one-day trip that focuses on the Blue Ridge basement rocks of the Dellwood and northern Hazelwood quadrangles. The trip will involve two to three short (100 m) hikes in densely wooded but relatively flat terrane. 3. Blue Ridge–Inner Piedmont Geotraverse from the Great Smoky Thrust to the Inner Piedmont: Upper Crust to Upper Lower Crust, Terranes, Large Faults, and Sutures. 5 p.m., 13 April–5:30 p.m., 15 April. Max: 30. US$290. Principal organizer: Arthur J. Merschat, USGS; co-organizers: J. Ryan Thigpen, University of Kentucky; Elizabeth McClellan, Radford University; Mark W. Cater, USGS; Robert D. Hatcher, Jr., University of Tennessee–Knoxville. Description: This 3-day field trip transects the southern Appalachian orogen. Unmetamorphosed sedimentary rocks of the frontal Blue Ridge will be examined at Parkville, Tennessee. The distal Laurentian margin will be crossed onto amphibolite to granulite facies rocks of the central Blue Ridge and Tugaloo terranes; the field trip will end in Inner Piedmont migmatites near Westminster, South Carolina. 4. Steaming through the Ordovician (Canceled). 14 April, 6:45 a.m.–2 p.m.
5. Lessons from Limestone: How to Teach All Sciences with Limestone (Canceled). 14 April, 7:30 a.m.–5 p.m.
6. Revisiting the Flynn Creek Impact Structure, Jackson County Tennessee. 14 April, 7:30 a.m.–6:30 p.m. Max: 32. US$130. Principal organizer: Steven J. Jaret, Stony Brook University; co-organizer: David T. King, Jr., Auburn University. Description: The Flynn Creek Impact Structure was originally recognized in 1968 by David Roddy as one of the original six confirmed impact structures on Earth. The Flynn Creek Impact Structure is also the first recognized marine target impact structure. Exposure at Flynn Creek varies, as there is no obvious rim and the geological map of the area does not look like a crater. But, there is an impact breccia unit dominated by two classes of breccia, the lower, chaotic, slump breccia and the upper graded resurge breccia. The post-impact unit is Chattanooga Shale, of which one facies is present only in the crater itself. Participants will visit historical outcrops identified by Roddy, including both the breccia units and the central uplift. New results from ongoing reinvestigations of a drill core from Flynn Creek, as well as insight from other marine-target impact structures in the southeast, will add to lively discussions. 7. Nutrient Hotspots through Time: Taphonomy in Modern and Fossil Ecosystems. 14 April, 8 a.m.–5:30 p.m. Max: 20. US$130. Principal organizer: Sarah W. Keenan, University of Tennessee–Knoxville; co-organizers: Christopher Widga, East Tennessee State University; Jennifer M. DeBruyn, University of Tennessee–Knoxville; Sean M. Schaeffer, University of Tennessee–Knoxville. Description: Hotspots represent ephemeral and pulsed introductions of nutrients into an environmental system. The breakdown and decomposition of organisms immediately after death is the first step in taphonomy, and sets the stage for potential preservation. In the geologic record, body or trace fossils and chemical records of past life (i.e., isotopic anomalies, redox zonation in sediment) provide evidence for preserved nutrient hotspots. Field trip participants will gain a deeper understanding of taphonomy, vertebrate decomposition in the modern, and potential preservation in the geologic past, by visiting two important hotspot localities in East Tennessee—the Miocene-age Gray Fossil Site and the Anthropological Research Facility (also known as “the Body Farm”), a human decomposition experimental site. 8. Hydrogeology and Structure of Tuckaleechee Cove and Vicinity. 14 April, 8:30 a.m.–6 p.m. Max: 22. US$130. Principal organizer: Ben Miller, USGS–Nashville; co-organizer: Terri Brown, University of Tennessee–Knoxville. Description: Field trip participants will visit karst features in the Tuckaleechee Cove window in the Great Smoky thrust sheet, and examine exposures of the Great Smoky fault and deformed Ordovician carbonate strata. Stops will include several springs in the Tuckaleechee Cove that are currently instrumented for a USGS hydrogeologic investigation, and the entrance to the deepest known cave in Tennessee, within the boundaries of the Great Smoky Mountains National Park. Topics of discussion will focus on tracer testing, decontamination, and cave access protocols in the Park, as well as landowner relations outside the Park, monitoring instrumentation, and implications of the spring study. The trip includes a tour of the beautiful Tuckaleechee Caverns to highlight geologic and hydrologic features within the cove. 9. Mesoscale Structures, Macroscale Folds, and Inferred Cratonic Basement Structures, Nashville Dome, Central Tennessee. 7 a.m., 14 April–4 p.m., 15 April. Max: 11. US$195. Principal organizer: Mark Abolins, Middle Tennessee State University. Description: Recent geologic investigations suggest that post-Ordovician mesoscale structures and macroscale folds in some parts of the Nashville dome, central Tennessee, formed because of slip on sub-surface cratonic basement faults. Recently published geophysical research also suggests that a north-northeast-trending Precambrian or Cambrian rift lies beneath the dome. Did reactivation of rift structures shape Ordovician stratigraphy and post-Ordovician structures? Participants will examine evidence exposed at the surface.